When Mary Magdalene met the Emperor Tiberius she held a plain egg in her hand and exclaimed "Christ is risen!" Caesar laughed, and said that Christ rising from the dead was as likely as the egg in her hand turning red while she held it. Before he finished speaking, the egg in her hand turned a bright red. 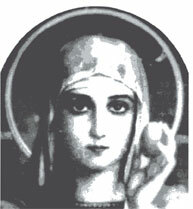 St. Mary Magdalene holding a red Easter egg with the words "Christ is Risen".